Psa. 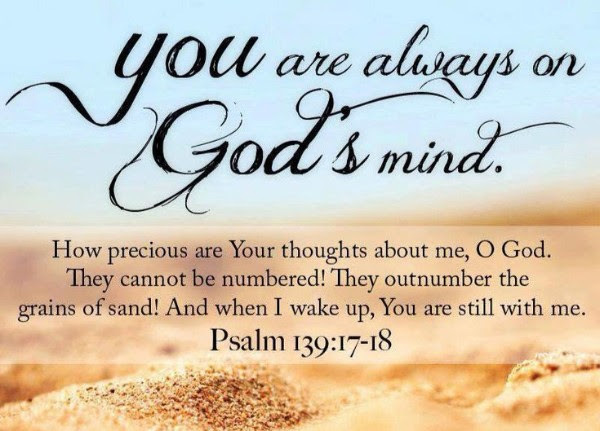 139:17-18 How precious also are thy thoughts unto me, O God! how great is the sum of them! If I should count them, they are more in number than the sand: when I awake, I am still with thee. I know you’re feeling like I don’t care; that I’ve forgotten about your needs, and that I have more important things on My mind. My child, I created you in My image; you are a part of Me. You are My most important creation. Oh, precious one, you’re feeling this way, because you don’t think about Me as much as you should. These thoughts and feelings of abandonment will rise up when you allow the problems of life to overrule the promises of the King. My child, no matter what see going on in this world; I want you to know you are always on My mind. You are on My mind when I close your eyes at night. You’re on My mind throughout the night, for I’m watching over you as you sleep, and in the morning; I’m the One who wakes you up with brand new mercies waiting for you. You’re on My mind when you leave your house each day. I’m the One who guides you safely to and from your daily destinations. You’re on My mind as I watch over you on your job, giving you favor with those in authority over you. You’re on My mind when you’re at school; it’s Me providing the wisdom needed to help you achieve. And you’re even on My mind when you shop. Oh yes, even there I am with you. I’m the One helping you to make the right selections; although sometimes you choose to go another way, My guidance is always there. Can’t you see that you are constantly on My mind? Now, can I ask you to think about Me this day? Can I ask you to lay aside the cares of this world, and spend some time thinking about Me? Think about Me and take time to pray before you leave your house. Think about Me and how I am watching over your home while you’re away. Think about Me as you’re driving; think about the traveling mercy that surrounds you to keep you safe. Think about Me as go about your daily work and the unmerited favor that’s raining down on you and blessing your life. Then, before you lie down; take some time to think about Me once more, and humble yourself in prayer, giving thanks for another blessed day. If you do this each and every day, you will never again doubt whether I’m thinking about you; for you are always on My mind. Psa. 115:12-13 The LORD hath been mindful of us: he will bless us; he will bless the house of Israel; he will bless the house of Aaron. He will bless them that fear the LORD, both small and great. Isa. 26:3 Thou wilt keep him in perfect peace, whose mind is stayed on thee: because he trusteth in thee. Php. 4:7-8 And the peace of God, which passeth all understanding, shall keep your hearts and minds through Christ Jesus. Finally, brethren, whatsoever things are true, whatsoever things are honest, whatsoever things are just, whatsoever things are pure, whatsoever things are lovely, whatsoever things are of good report; if there be any virtue, and if there be any praise, think on these things.